Our bet on a junk-bond disaster entails calendar-spreading put options on Barclay’s High-Yield Bond ETF (ARCX: JNK). This trading vehicle is shown in the chart above. As you can see, except for a couple of nasty dips that occurred several years ago, JNK hasn’t done much of anything since recovering from the Great Financial Crisis. In retrospect, the only way an option trader could have made money on price movement this boring is to have sold straddles (i.e., puts and calls in combination) against JNK, and to have presciently refrained from doing so during the killer declines of May 2010 and August-September 2011. If you’d been caught flatfooted on either of those selloffs, you’d probably have given up all the profits you’d made being right the remaining 90% of the time. You may be wondering at this point how we’re going to make money buying puts if the puts already “know,” as I’ve implied they do, that the bull market in junk bonds is fated to end badly. The answer is that we are not buying puts outright, but in calendar-spreads where, for each option we buy, we short another against it. This hardly guarantees a winner, since even the value of calendar spreads falls to zero over time. But suppose we were to “roll” the spread forward each month, remaining long a put option with a distant maturity while selling closer maturities against it from one month to the next. To illustrate, with JNK currently trading for around 40, we can “anchor” our spread by buying January 35 puts for around 0.20. Yes, JNK would have to fall sharply to make that a winning bet — about 13% between now and January 17, when the puts expire. Our profits would come only with JNK trading below 34.80 at that time. However, we can reduce our risk significantly, possibly even eliminating it, by “rolling” the calendar spread each month. In this example, against long January 35 puts, we would short October 35 puts for a current price of 0.05 . That would give us the January 35/October 0.35 put spread for a net debit of 0.15. Come October 18, when the puts we are short are due to expire, we would cover them (i.e., buy them back) while selling November 35 puts. If JNK has moved lower over that time, we may even be able to short the Nov puts for 0.10 or more. If we were to get 0.15 for them, assuming the October puts expire worthless, that would cover the entire cost of the January puts we would continue to hold. Under ideal circumstances, with JNK falling slowly toward 35 over the next four months, we could conceivably be holding the January puts for a net credit at the time they expire or even before then. 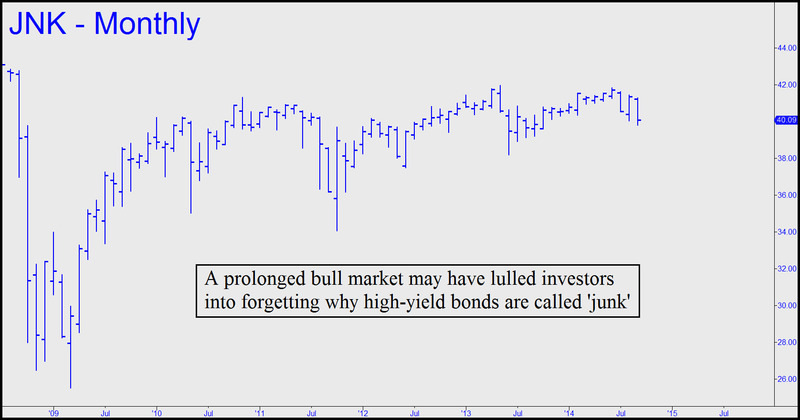 Holding “free” puts is a great place to be in these all-too-interesting times – especially on the junk-bond market, and most especially if you believe as I do that sooner or later, investors will be reminded of why junk bonds came to be called “junk” in the first place. My take is that the bull market in junk paper since 2009 is egregiously overdone. It was caused mainly by investors grown dangerously hungry for yield at a time when the interest paid on “safe” paper has been abysmal. By using a conservative calendar-spreading strategy, then further reducing our premium risk by rolling the short side of the spread on a regular basis, we can bet on a junk-bond crash till the cows come home without paying a significant penalty even if we are wrong. We will be tweaking this strategy in real time in the weeks ahead. If you want to stay closely apprised, including via intraday updates and e-mail bulletins , the Rick’s Picks chat room is the place to be. To access the 24/7 virtual room and all of Rick’s trading “touts” and services, click here for a free trial subscription. October 16, 2014 come as part of the package. Learn options trading strategies from former market maker Rick Ackerman, who was once labeled by Barron's as an "intrepid trader" in a headline that alluded to his key role in solving a notorious pill-tampering case. He received a $200,000 reward when a conviction resulted, and the story was retold on TV's FBI: The Untold Story. But to the gang at CNBC, he's been a pariah for the last ten years - a shoot-from-the-hip kinda guy whose irreverent style got him banned from the show after an interview on Squawk Box was alleged to have gone awry. Rick's professional background includes 12 years as a market maker on the floor of the Pacific Coast Exchange, three as an investigator with renowned San Francisco private eye Hal Lipset, seven as a reporter and newspaper editor, three as a columnist for the Sunday San Francisco Examiner, and two decades as a contributor to publications ranging from Barron's to The Antiquarian Bookman to Fleet Street Letter and Utne Reader. His detailed strategies for stocks, options, and indexes have appeared since the early 1990s in Black Box Forecasts, a newsletter he founded that originally was geared to professional option traders. Rick Ackerman is the editor of Rick's Picks and a partner in Blue Fin Financial LLC, a trading firm.